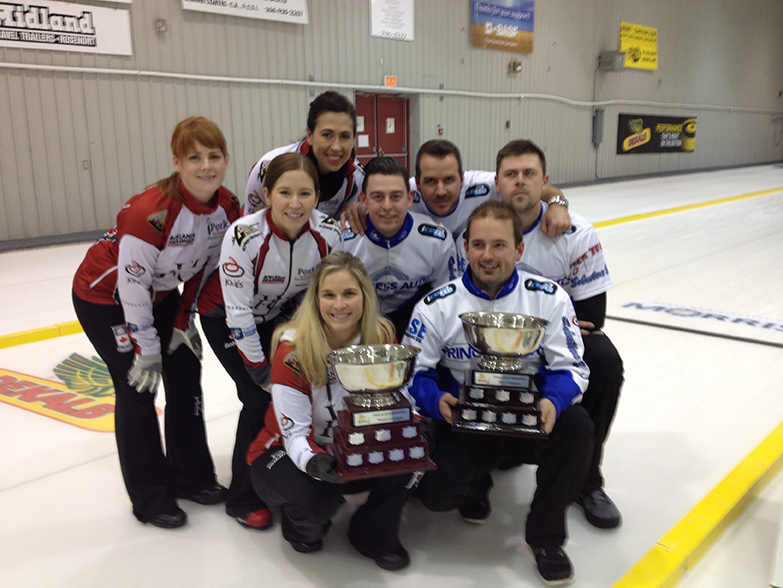 Both the men’s and the women’s 2015 DEKALB SuperSpiel champions will be back November 18 – 21, 2016 to defend their titles. Men’s winner Reid Carruthers and Women’s winner Jennifer Jones and their teams are returning to the 2016 DEKALB SuperSpiel. Both teams are hoping to become the first team to have a repeat championship title in this event. Jennifer Jones and her Olympic gold medalist team of Kaitlyn Lawes, Jill Officer and Dawn McEwen are not new comers to the DEKALB SuperSpiel. They have always been fan favorites here and our fans are looking forward to seeing them again this year. They have made the playoffs many times, were runners up in 2014 and champions in 2015. This team has been together for several years and are regular in Grand Slam events and the Scotties both Nationally and Provincially. This team is known, respected and loved by all curling fans. They are great ambassadors of this great sport. Be sure to come out and watch this team in action this November 18 – 21st. Reid Carruthers with his team, Braeden Moskowy at third, Derek Samagalski at second and Colin Hodgson at lead are looking forward to another great year. Although they have only one DEKALB SuperSpiel Championship as a complete team, Braeden does hold the 2011 title with his past team of Kyle Muyres, D.J. Kidby and Dustin Kidby. Reid playing with Jeff Stoughton has had numerous provincial and national appearances. This experience combined with the experiences of his team mates, Braeden, Derek and Colin have led to lots of wins and championships. They have had a lot of success at all levels including representing Manitoba at the Tim Horton’s Brier in 2015. They have had many Grand Slam of Curling appearances and lots of wins there too. Will they become the 2016 DEKALB SuperSpiel Champions? We are excited to have this team back again and look forward to watching them at the 2016 DEKALB SuperSpiel. Curling begins Friday, November 18th in both venues; the Morris Curling Club in Morris, Manitoba and in the Rosenort arena in Rosenort, Manitoba. Curling continues all weekend with the qualifying round on Monday, November 21st. The Championship game for both the men and the women takes place in the Morris Curling Rink at 4pm. See you all there.